Lemon Cheesecake Bars | FoodGaZm..
**Make the crust. Preheat oven to 325 degrees. Line the bottom and side of an 8″ square pan* with aluminum foil to make a sling. Crimp the overhanging foil to the edges of the pan. **In a food processor, pulse graham crackers and sugar until fine (or if your angry and need to vent, roll the crackers sealed in a plastic bag with a rolling pin–take a few whacks if necessary). Add butter and mix until moistened. Transfer crumb mixture to the pan and press into the bottom. Bake the crust for 10-12 minutes or until just beginning to brown. **While crust bakes, make the filling. Whip the cream cheese in a stand mixer until light and fluffy. Add sugar, eggs, lemon zest, lemon juice, heavy cream, vanilla and salt stopping frequently to scrape down the sides of the bowl. Pour the mixture on top of the hot crust and spread it evenly to the sides. Shake the pan to smooth the top. Bake for 30-35 minutes or until top is no longer shiny and the filling jiggles only slightly when shaken. **As the cheesecake bakes, make the topping. Heat the lemon juice in a medium saucepan, on medium heat until hot, but not boiling. Whisk the eggs in a small bowl and slowly whisk in the sugar. Whisking constantly, slowly pour in half of the hot lemon juice into the egg mixture, then return the egg/lemon juice mixture to the saucepan and continue cooking and stirring until mixture reaches 170 degrees or it’s thick enough to coat the back of a spoon, about 3 minutes. Immediately remove the pan from the heat, add the butter and stir until incorporated. Stir in the cream, vanilla, and salt , stirring until smooth. Cover with plastic wrap and refrigerate until needed. 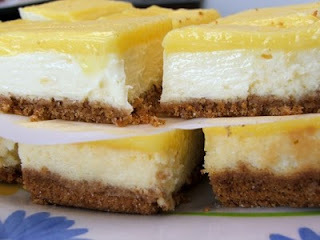 **After the cheesecake comes out of the oven, pour the lemon topping on top and smooth out for even coverage. Cover with plastic wrap and let pan cool, about 20-30 minutes. Place cooled cheesecake in the refrigerator for at least 5 hours (but up to 2 days) to set.